Reviews can be the bane of a blogger’s existence: it is not uncommon to have companies approach us to review products that fall short of expectations, or offer little to no value proposition over already commercially available products. In other words, we get used to being pressured to like things that may not warrant a review, or the time spent to thoroughly evaluate them. And if we’re being honest, sometimes we just have to say no. But this week, we’d like to tell you about a new product that not only met, but completely surpassed our expectations. Our pack is aging, and the challenges that come with old age (especially in labs) can make feeding a challenge. Allergies have been a constant concern, one that we alleviated when we switched to Natural Balance LID (Limited Ingredient Diets) dry dog formula years ago. Skin rashes and itching subsided permanently when we made the change and we’ve never looked back. Recently, we had a scare when our twelve year old lab stopped eating. This is always concerning with an older dog, but in our case it’s even more complicated – she’s on a regimen of critically important meds that help control a life threatening autoimmune disorder, and the medications require food. So a few days of abstinence could prove fatal in her case. We tried everything we could think of to turn her around. We purchased dozens of varieties of canned food, offered her a number of dry formulas that we had on hand, and even tried tempting her with home cooked meals. The only thing she would eat (sporadically) was boiled chicken and rice, and even that wasn’t going over well. We were frightened and defeated. Just as our exasperation reached its peak, a package arrived in the mail. 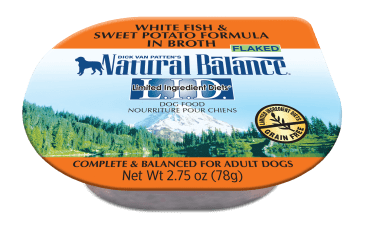 Natural Balance is our food sponsor, and they are kind enough to send us new product samples: this shipment happened to include new LID wet cups, in both whitefish and chicken flavors. We opened a cup to offer to our old girl and she surprised us – not only did she show interest in a commercial food for the first time in weeks, she ate with enthusiasm. That day marked the beginning of her recovery. Consider us big fans. We can’t think of a better endorsement. Grain free and delicious, L.I.D. wet cups are true limited ingredient diets and feature a single premium quality protein source and limited, wholesome carbohydrate sources that come together in one scrumptious, hearty cup. Hand-crafted and cooked to perfection in a savory broth, L.I.D. 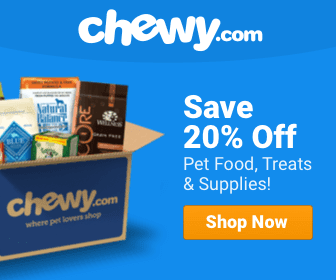 wet cups deliver essential nutrition with the deliciousness your dog deserves. Contains no corn, wheat, soy, artificial preservatives, flavors or colors. Limited Ingredient Diets wet cups minimize the chance of food sensitivities by containing only the very best protein and carbohydrates your best friend needs for a healthy and satisfying diet. We can’t say enough about our positive experience with these new formulas, but don’t take our word for it – visit Natural Balance to learn more and find special offers on a number of formulas.